Journals and proceedings of the Arctic expedition, 1875-6, under the command of Captain Sir George S. Nares, R.N., K.C.B.... Presented to both Houses of Parliament by command of Her Majesty, 1877. London: for Her Majesty's Stationary Office, . 2° (33 x 21cm.) 31 lithographed charts, maps, and views only. (Lacking one chart and 6 or more pages of text at one end, one chart with small repairs to folds, another with old stain and ragged outer margin, a third with tear along fold, final page of text with laminated repair at upper margin.) Original blue printed wrappers (rebacked, covers laid down on free endpapers). A PHOTOGRAPH ALBUM COMPILED BY H.C. HART, NATURALIST ON THE EXPEDITION, oblong 4° (34.3 x 26.5cm. ), containing a mounted sample of the expedition writing paper and envelope, both with embossed vignettes of the ships Alert and Discovery, and 63 albumen prints, most mounted one to a page and averaging 6¼ x 8¼in. (157 x 209mm. ), each with manuscript caption in pen-and-ink by Hart, several also captioned in the negative and credited to J. Mitchell. (Some browning to edges of images.) Contemporary black calf by T.H. Reilly, 24 Grafton St., Dublin, titled in gilt on upper cover: 'British Polar Expedition. 1875-6. H.C. Hart, Naturalist, H.M.S. Discovery.' The two volumes preserved together in modern blue half morocco box. Henry Chichester Clark, binding and bookplate. Anon. sale Christie's, 29 April 1999, lot 141. The British Arctic Expedition (May 29 1875 - November 2, 1876) was sent by the Admiralty to attempt to reach the North Pole by way of Smith Sound. The two ships H.M.S. Alert and H.M.S. Discovery reached Discovery Harbour, on the northern side of Lady Franklin Bay, Ellesmere Island, on 25 August. While this site was chosen as Discovery's winter quarters, Alert continued up Robeson Channel to Floeberg Beach, Ellesmere Island, to 82°28'N, the highest latitude reached by any ship up to that date. In early April, three major sledging parties, which are the main subject of the above report, set out to explore the North Pole, and the north coasts of Ellesmere Island and Greenland. The Pole party, led by Commander A.H. Markham, achieved a record latitude of 83°20'26''N (on May 12) but covered no more than 50km over the ice before turning back on account of worsening scurvy, which also badly affected the other sledge parties. The expedition was nevertheless able to return 'with a large quantity of zoological, geological, botanical, ethnographical, and other scientific observations' (see Holland Arctic Exploration, New York, 1994, pp.297-98). The photographs in Hart's album perfectly complement the official government report on the expedition. 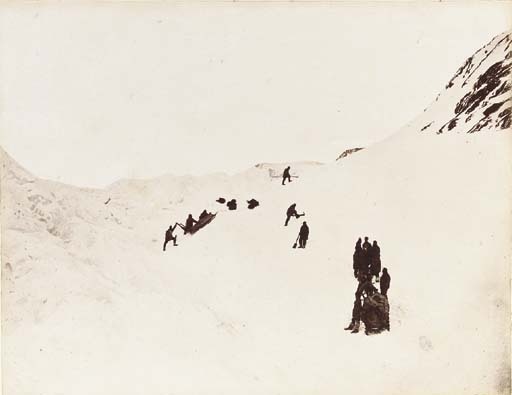 Showing views of the Discovery and Alert on their outward journey among ice floes and 'floebergs', groups of eskimos, the two ships frozen in their respective winter quarters and the theatre of ice built by the Discovery's crew, sledging teams, and huddled groups of men, they are among the earliest known Arctic photographs.